The sun, like all other heavenly bodies, rises in the east and sets in the west. In the summer the sun rises in the northeast and sets in the northwest. At the equinoxes it rises due east and sets due west. In the winter it rises in the southeast and sets in the southwest. The maximum northern and southern rise positions occur at the summer and winter solstices. The due east sunrises occur at the spring and autumn equinoxes. The three main eastward-bowing curves of the serpent’s body “point” to the sunrise positions at the solstices and equinoxes. As the Sun moves over the Mound, rising from east and setting in the west, it also drifts north and south according to the seasons. It would be curious, however, for broad curves to be used as the “pointers” for the rising points of the sun. Sunrise positions repeat precisely from one year to the next. Even ancient people could mark sunrise positions with great precision. Why the rounded pointers? This leads us to look further. In general the sun and moon don’t line up. The moon rises in the east and sets in the west, but whereas the position of sunrise sweeps from northeast to southeast and back again over the period of a year, the moon rise position sweeps from northeast to southeast and back again, one full cycle each month. Predicting moon rise positions from night to night is a very complicated calculation that is far beyond the capabilities of ancient people. But if we focus only on the risings of the full moon the problem is greatly simplified. These are the computed* moon rise positions along the eastern horizon over about a 1-year period. Azimuth refers to the compass direction in degrees. North is 0°, east is 90°, south is 180°, and west is 270°. The red dots indicate the full moons. Notice that the moon rise position does a full cycle from northeast to southeast and back again each month, but if we focus only on the full moons, we get a 1-year cycle. Computing approximate rise positions of the full moon is much easier than moon rise positions in general. 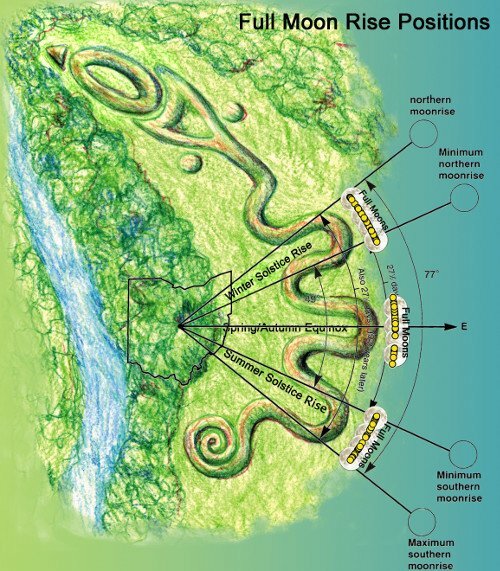 The usability of Serpent Mound for moon rise predictions requires focusing attention only on the full moons. The rise position of the full moon is easy to determine because when the moon is full it is directly opposite the sun in the sky. When the sun is setting somewhere along the western horizon, the moon (if it is full) simultaneously rises on the opposite horizon 180° from the position of sunset. The full moon rise near the summer solstice is in the southeast and the full moon rise near the winter solstice is in the northeast because in each case it is opposite the position of sunset. Since sunset positions are very predictable, the rise positions of the full moon should be predictable with equal precision, except there is a further complication. Unlike the planets, which orbit the sun with relatively little interference from the gravity of other bodies, the moon orbits the earth with a major disruptor to modify its orbit: the sun. This is what is called a “three body problem.” The moon’s orbit around the earth in tilted (about 5°), but its orbital plane does not remain fixed in space. It wobbles (technically, “precesses”), much like the wobbling of a top. This wobble sometimes adds and sometimes subtracts from the northeast to southeast annual excursion of the full moon rise positions. The pattern induced by this wobble repeats itself every 18.6 years. The range of full moon rise positions along the eastern horizon depends on the year, with an 18.6 year periodicity induced by the wobble (precession) of the moon’s orbital plane. With modern computers we can deal with this added complication, but the simple rule of looking opposite the setting sun works only for the average full moon rise positions. What ancient people were able to do was to predict the average rise positions of the full moon, and by observation determine the amount of year-to-year variation in this measurement. 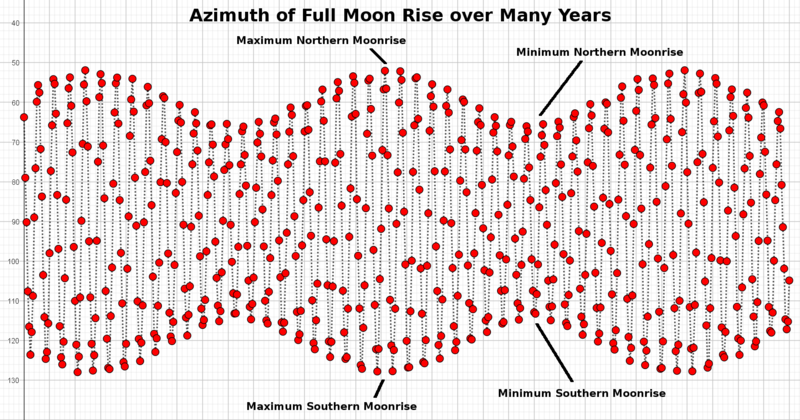 What I discovered when I started looking at the deviations from the average full moon rise positions was that the spread of actual moon rises around the average rise positions matched the widths of the eastward-bowing curves of the serpent’s body. This sheds new light on the use of rounded moon rise pointers. The centerlines of the pointers mark the average full moon rises nearest the solstices and equinoxes and the widths of the curves indicate the range of variation. We have overlaid Dr. Bradley Lepper’s chart of the Moon’s Maximum and Minimum, Northern and Southern rise positions onto the figure of the serpent. His calculations correspond well with the curves in the body of the serpent. Also shown are computed positions of actual risings of the full moons nearest the solstices and equinoxes over several hundred years. 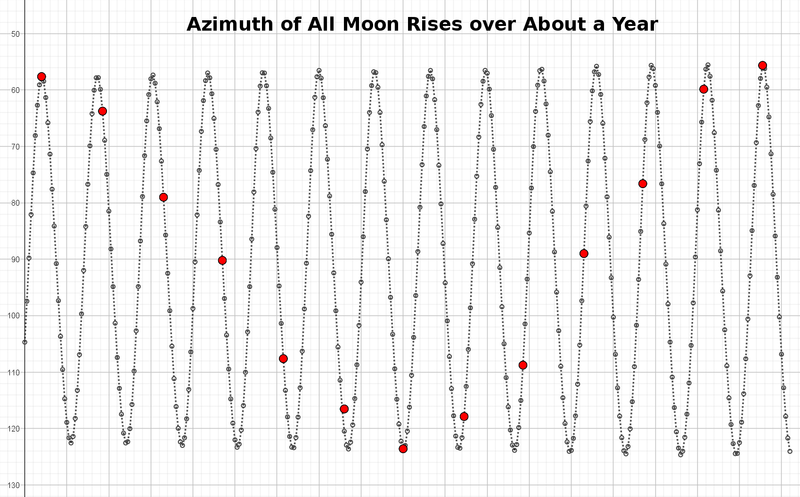 To test this hypothesis I computed the rises of the full moon over several hundred years. Since the eastward-bowing curves in the serpent’s body are clearly equinox and solstice pointers, I took only the full moons closest to the equinoxes and solstices. The degree to which the spread of the full moon rise positions agreed with the widths of the curves of the serpent’s body is striking. 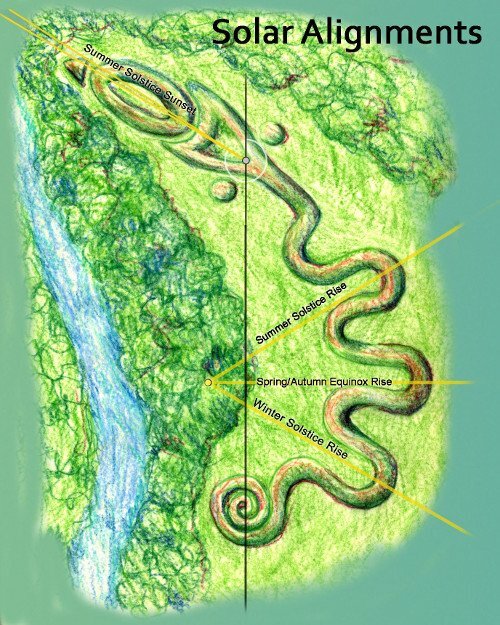 The curves in the body of the serpent appear to have been intentionally designed to capture the full range of variability in the full moon rise positions. It is interesting that whereas the solstices and equinoxes are solar concepts, the curved pointers of the serpent’s body are apparently being used as lunar pointers. The problem is, times of solstice and equinox may not correspond with the times of full moon. To make sense of this “conceptual mismatch” the full moon rise positions selected here are for the full moons closest to the solstices and equinoxes. The sunset position near the solstices varies little from one day to the next, so the opposite point on the horizon, the average full moon rise point, would remain in good alignment with the pointers on the ground for a fair number of days. (The sunset position does actually vary considerably from one day to the next around the equinox, so the equinox full moon rise pointer would be expected to be somewhat less precise than for the solstices.) The discrepancies introduced by making these adjustments in timing do not disrupt the patterns we have found. When it comes time to interpret the significance of these observations we must therefore attempt to answer why these people were interested in the lunar cycles and why they tied them to the equinoxes and solstices. Making the leap to interpretation we must look at these issues from other angles. I will leave it to my collaborator, Constance Tippett, to lay the groundwork for this interpretation. Then I will return and look at the interesting alignment (or misalignment) of the Serpent’s head with the point of sunset at the summer solstice. *All astronomical calculations for this project were conducted using the Python programming language and PyEphem, a general purpose ephemeris package applicable for historical time periods such as this. Calculations were done for the time period circa 400 BCE.